It’s a market of wild swings, powerful trends and enough overshoot to make Evel Knievel blush. Oil just logged its largest one-day drop in three years. That comes after a 21% slide in just 28 trading days. That is on the heels of oil’s 75% bull market rally since June 2017. Surprisingly, there is one slice of the energy market that is pretty much drama free. But there’s excitement brewing in this quiet sector. And it corresponds with an opportunity to make 20% gains in six months’ time. I’m talking about energy infrastructure — companies that transport and store crude oil and refined petroleum products. And I see a sweet opportunity to buy into this sector. Matt Badiali and I talked about developments within the energy infrastructure sector, and he’s excited about new pipelines coming online from West Texas. He figures these new pipelines will carry about 1 million barrels of oil per day. And that will directly benefit the master limited partnerships (MLPs) involved. Most investors are currently concerned about the falling price of oil and its potential impact. Matt and I have noticed MLPs can be somewhat correlated to oil in the short term. 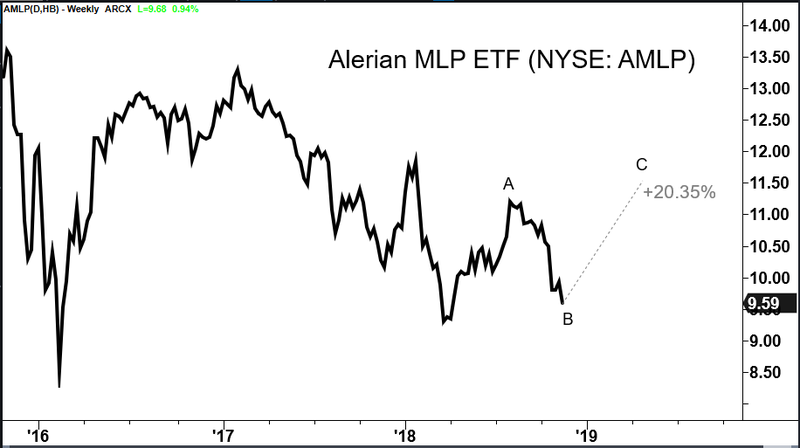 In particular, Matt pointed out that the Alerian MLP ETF (NYSE: AMLP) fell 8% over the past month, tracking oil’s decline. But when commodity dropped more than 7% on Tuesday, AMLP shed a mere 1.74%. Clearly, though, the long-term trend is not correlated. Over the past two years, the oil price doubled. However, AMLP fell about 25%. AMLP is an exchange-traded fund (ETF) you can use to invest in a basket of MLPs. It established a critical low in March. Then it rallied. Then it dropped back. Now, AMLP is poised to climb 20% in the next six months. It could even go higher than that. As a bonus, AMLP boasts an 8.4% dividend yield! Matt and I are looking for oil prices to bounce back very soon, which should give MLPs a nice bump. That, plus the budding excitement in the Permian, tells me now is a good time to get in.